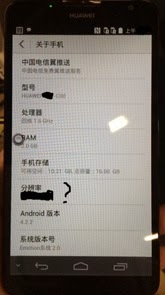 Based on the latest news, Huawei is rumored to be soon released a series of Ascend Mate 2 in the near future. Unfortunately, the rumors phablet presence has been pushed to the surface since last August is still very mysterious. Some sources themselves say that Huawei will still entrust sector Ascend Mate 2 on screen display size of 6.1 inches, the same as the first Ascend Mate. But interestingly, no longer given resolution HD 720p, but 1080p Full HD. In addition to Full HD display, reportedly Ascend Mate 2 will also be powered by quad-core 1.6GHz Cortex-A9 with Mali-450 GPU support and 2GB of RAM. No lag, 16GB of internal memory along with Android 4.2.2 Jelly Bean will be pinned together with a user-interface Emotion UI latest version.